Scientific Certification Systems (SCS), a third party verifier of agricultural and environmental product claims and the certifier of choice for greener products from Safeway, The Home Depot, Kelly-Moore Paints, and others, is proud to announce the expansion of its marketing communications services team. SCS, an Inc. Magazine "Fastest Growing Company", is hiring two new marketing communications team members and promoting a current staff member. Joining the team this week is Chip Wood, former Sr. Director of Marketing at Sustainable Life Media, and recently the V.P. of Conferences at Justmeans, where he helped build the product set, brand penetration and corporate relationships with sustainability leaders like Johnson & Johnson, Mars, Del Monte, and Coca-Cola for these two leading voices in the B2B sustainability media, education, training and events sector. In a newly created role of Marketing Specialist for the company’s Food and Agriculture Division, Chip will lead marketing and communications for SCS’ 15+ food, fisheries, agriculture, floriculture, horticulture and sustainability related certification products, food safety and handling trainings, and numerous auditing and testing services supporting food producers’, manufacturers’, and retailers’ efforts to produce and supply the market with healthy and safe, tasty and nutritious, and in some cases organic food and agriculture products. Chip brings 15 years’ B2B business development and marketing experience to the job, most recently with a sustainability focus. He co-founded Next Steps Marketing, a San Francisco marketing services firm in 2002 and co-launched Greenlight Magazine, an early entry green consumer products and lifestyle magazine in 2005. In more recent years he has worked with West Coast Green, Clean Tech Open, Sustainable Industries, Discovery Communications, and O’Reilly Media on new product launches and brand marketing. Chip graduated from the University of Pennsylvania in Philadelphia and is continuing graduate work at The University of California, Berkeley. 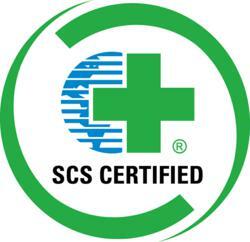 SCS has been providing global leadership in third-party sustainability and environmental certification, auditing, testing and standards development since 1984. SCS programs span a wide range of product and industries, including green building, consumer and business product manufacturing, food and agriculture, forestry, fishery management, energy production and more.